A PLAN by Finance Minister Sammy Wilson to introduce a levy on so-called out-of-town shopping centres is “unsustainable” and would undermine job creation and investment, a body which represents traders has claimed. The British Retail Consortium’s Richard Dodd told The Detail the plan is not in the wider interest of Northern Ireland. Meanwhile, its understood that Northern Ireland’s largest retailer, Tesco will lead opposition to the Finance Minister’s plans. During his Budget speech Mr Wilson had outlined plans for proposals which would see large out-of-town shopping developments, plus large city centre retail properties subsidising smaller city centre stores’ rates. But Richard Dodd says the tax “would undermine job creation and investment in the retail sector and town centres”. Mr Dodd believes this “Robin Hood Tax” will only add new cost that will only serve to hinder the ability for the retail industry to recover. The comments come after a week of mixed fortunes for city centre traders. Many smaller businesses had welcomed the Finance Minister’s comments but by the end of last week they were dismayed once more at the news that the Department for Regional Development is planning to raise millions of pounds in revenue by introducing parking charges across towns which have so far escaped fines. Donald McFetridge, a retail expert at the University of Ulster, has predicted a bleak future for independent retailers across Northern Ireland and believes town centre shopping here will be completely replaced by out-of-town retail parks over the next 20 years. The business studies lecturer also believes independent shops ares in danger of disappearing completely from the high street. He said: “I don’t think we’re going to see the complete demise of town centres overnight but within the next 20 to 25-years town centres as we presently know them will not exist. “Basically what we see now as retail parks are the new town centres of the future. Many independent retailers do not like to hear that but unfortunately that’s been the experience in the US and other parts of the world. In recent years issues around the plight of the local stores have played out in headlines about ‘dreaded’ out-of-town retailers – most famously with the proposed John Lewis store at Sprucefield and with news that upmarket food retailer Waitrose is considering sites in the Greater Belfast area. Perhaps it’s no surprise then that it’s on the Finance Minister’s list of priorities. With the Assembly elections just weeks away, some sceptics have dubbed his levy plan as nothing less than politiking; pointing out that it will be the people who occupy the cities and towns here who will go to the ballot box and not large multinationals. In a statement to The Detail the Department of Finance defended the Minister’s proposal. It read: “Over the coming months the Department will be examining how best to rebalance the system of business rates, with proposals to be brought forward to extend the small business rate relief scheme. Teso has 35 supermarktes in Northern Ireland and employs over 9000 people. Its understood that Tesco has been watching developments closely and is opposed to the Department’s plans. Meanwhile in Derry, as preparations begin for its hosting of the UK City of Culture in 2013, many traders ask what culture will be here if we don’t have any shops? Martin McCrossan, the Chair of Derry City Centre Traders forum, welcomed the Minister’s levy plan but believes it won’t solve the bigger problem. He said: “Some of our independent traders have seen this as a possible lifeline. We are hoping that they have finally listened to our concern, but some of these out-of-town shopping centres are paying as low as 20% less per square footage of what people are paying in the city centre and surely anyone would agree that that is ridiculous. “Gradually throughout this city there are out-of-town developments, which basically means that our town is emptying. The so-called “doughnut effect”, sees out-of-town retailers build a solid base on the outskirts of a town leaving a gaping hole in the middle where retailers once flourished. On the outskirts of Derry at Crescent Link Retail Park, there are plans to build a 40,000 square foot ASDA . Local Sinn Fein MLA, Martina Anderson, told The Detail the impact the out-of-town retailers on the city was impossible to ignore. She said: “There is the issue of the cost of doing business and there is the impact that out-of-town developments have on city centres. “This doughnut impacts on building outside by hollowing out the core whilst at the same time charging large retail properties doing very well the same as small independent retailers who are struggling. 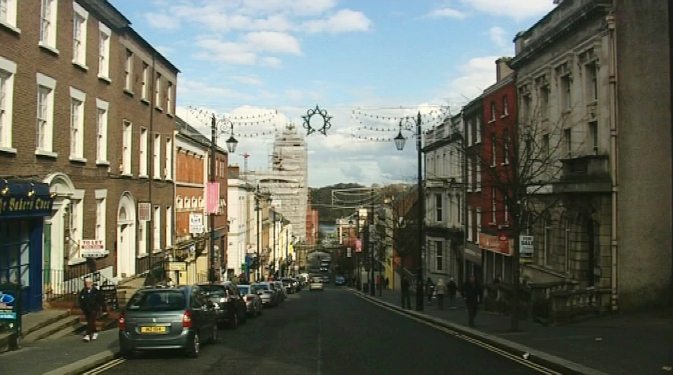 “Derry has 547,000 square feet of comparison shopping with a population of over 100,000. Compare that to Letterkenny with a population of some 18,000 – it has around 444,000 square feet of comparison shopping. We contacted ASDA about their planned development but they declined to comment. The British Retail Consortium’s Richard Dodd is adamant the Finance Minister’s new proposals will not work. The success of the out-of-town retail shop in Northern Ireland cannot be ignored. You only have to look the ASDA store in Enniskillen which at one point was the company’s second highest performing UK store. Whether it’s Lisburn, Lurgan, Portstewart or Derry, closed shutters in the town centre are an all too common sight. In the past city centres were not just a collection of shops, they were economic drivers and major employment generators. However, over the past 10 years, with the continuing issues around parking and the dominance of out-of-town superstores, the footfall in town centres has been reducing at an alarming rate. So the question remains -are town centres doomed to the pages of history or can the Finance Minister’s proposals, due to come into effect in April 2012, be their salvation? Critics will say this will largely depend on the extent to which the proposals will actually be implemented. Many believe that even if Mr Wilson’s plan passes through the Assembly, it will then get bogged down in the type of litigation that has strangled many planners and developers over the past 10 years. As it stands the small business rates relief scheme currently in place benefits around 16,000 smaller businesses across Northern Ireland which receive a rates reduction of up to 50% for eligible properties with an NAV (Net Asset Value) up to and including £2,000 and 25% relief for eligible properties with an NAV of between £2,001-£5,000. Under the proposed new arrangements it is expected that the amount of rates relief available will be doubled. In the meantime Donald McFetridge believes small businesses could be doing a lot more to help themselves.